Skarraghbrae Gigolo of Primprau (aka Gigolo) is also quite international already. He is bred in Winnepeg, Manitoba by Ailsa Stark (Skarraghbrae) and is now living in Kokkedal, Denmark – he has a future as a stud in Sweden, Norway, and possibly Finland. Gigolo is a bit careful in new situations, but his curiosity and need of attention soon gets the better of him. 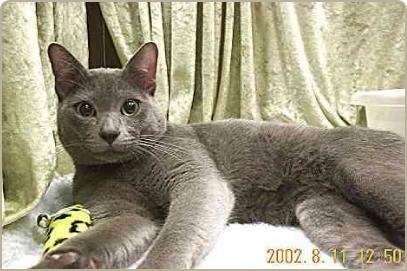 He is a very social cat – he must have human or feline company to be happy. He doesn’t like travelling – at least not if he is alone in the carrier (that’s how social he is – he needs feline company in his carrier also). He is very loving – delights in having his belly rubbed. 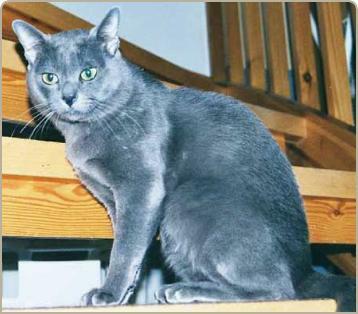 He brings forward some old lines in our pedigrees that carry some important features – plenty of silvertipping, medium blue coat, silky textured and close-lying coat, larger cats, and wonderful tempers. It will be very interesting to see how many of these desirable traits he passes on to his kittens with a variety of queens in Scandinavia and Continental Europe. He is at limited stud, because I would prefer not to find him in all pedigrees in the future – as has happened with other popular studs in the past. Also, I prefer not to keep my (male and female) breeding cats whole for more 4 to 5 years at the most. It is my belief that the best life for a cat is as a neutered pet in a loving home. As a breeder, I have to keep some cats whole and breed them, but it is also my responsibility to make sure my cats have the best life possible. So after a breeding carreer of 4 to 5 years, they are neutered and placed in my own group of cats or in a good and loving home as pampered pets.